Winter photo of a famous PTown summer landmark. I shot this photo on Commercial Street the other night when there was a little lull between snow showers in the predawn hours. 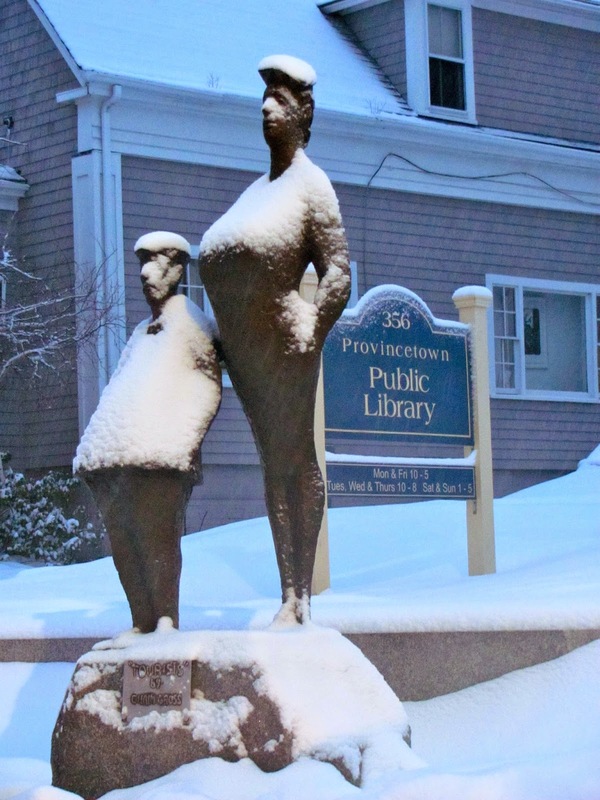 Tourists, by world renowned sculptor Chaim Gross, stands in front of the Provincetown Public Library, and is probably one of the most photographed spots in town. But that's in the summertime. Few people ever see pictures of PTown in the winter, which makes for some very popular scenes, seen rarely, even in local photography shops. In fact, snowy Provincetown scenes are some of the best sellers simply for their rarity. If you have a camera, get outdoors and look for a different slant on things, like a bicycle in the snow, or anything else not typically seen in the summer. Between shots, keep your camera inside your coat to help keep the battery from freezing and running down within just a few photos, and take some extra batteries with you, in an inside pocket. Have fun getting some unusual photos with all this snow on the ground, and elsewhere. Remember to look up, as well. And don't forget to be careful out there. Pasta, garlic bread and salad are a luncheon favorite. Every Saturday in January and February a Community Luncheon is served at Saint Mary of the Harbor Episcopal Church, at 517 Commercial Street. Everyone is invited, at no charge. From noon until 1 PM each Saturday, a different lunch every week is served to neighbors, friends and visitors who gather around large, communal tables to share a meal and socialize a bit, and make new friends. Live music from many instruments is part of the fun. Trays of cookies, brownies and other treats follow the main course, the coffee flows freely, and folks often sit for a while after lunch enjoying the music that's provided by Cape Cod musicians who entertain diners, playing a variety of instruments and singing throughout the meal. Some of these musicians are local people, and some have been traveling here to play every Saturday for years. Diners even get up and dance to the music. Join in on the fun, and a pleasant meal with friends, as these last two Saturdays in February bring another season of these great Community Luncheons to a close. Commercial Street snow heaps grow by layers upon layers. Considering the kind of storms we've been having, with snow several times each week, and an actual blizzard thrown in here and there, we seem to be doing alright. Thankfully, yesterday's storm wasn't as brutal as predicted, which is often the case here. And the power outage in Provincetown this time was of a fairly short duration, with most homes getting their electricity back on in fairly quick order, considering the stiff winds and brutal temperatures the repair crews faced. We thank them, truly, for their dedication to keeping us warm and safe in this formidable, often dangerous weather. Folks still seem to have a sense of humor about this very challenging winter, too, and that helps. Most people I've talked to on the street have been fairly upbeat as they're shoveling their walks for the second time that day, or digging their cars out again, before the next storm makes all that snow too heavy to lift. 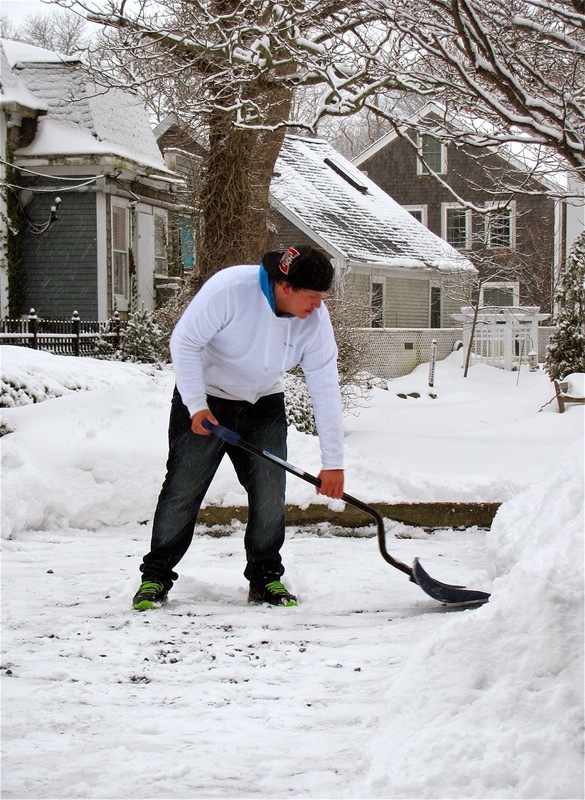 As the snow drifts and the piles left behind by the plows grow by a few inches with every new inch of snow that falls in Provincetown, streets are getting just a bit narrower day by day. Make sure you're extra cautious, whether you're walking or driving, especially near driveways and intersections where it's more difficult daily to see around these mounds. Once again, a neighbor shovels the "path" from Pearl Street to his house. 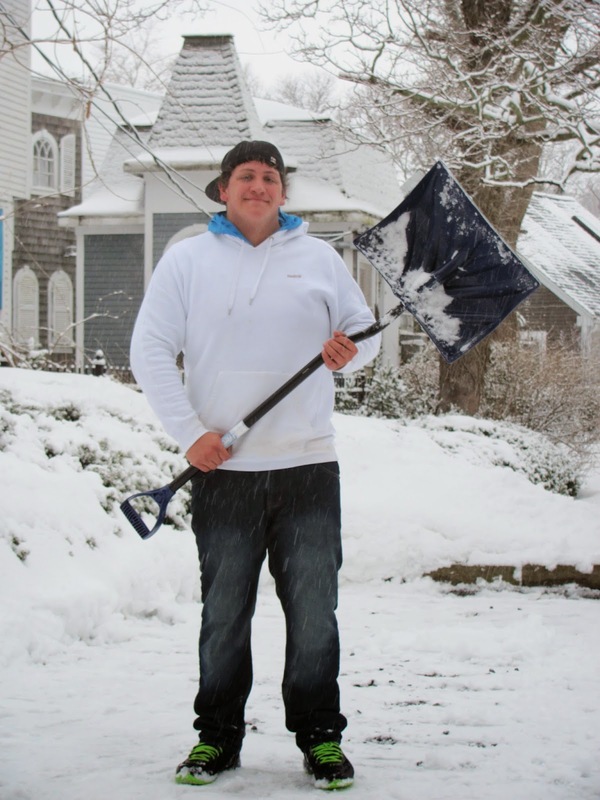 A neighbor on Pearl Street was up very early the other morning, shoveling out the path to his house one more time, "…trying to stay ahead of the storm." The snow piles were already as tall as he was, with much more piled on since then, and the forecast for tomorrow is calling for yet another three to five inches. I don't know how long our fairly cheery dispositions can last, but for now, at least, we are still hardy New Englanders, carrying on, and helping out our neighbors in the face of the next storm. station in South Dennis. just off of Route 6, near the Patriot Square Mall. When I noticed the cost of gas in PTown the other day I found a variety of prices at our four gas stations. The Tedeschi station (at Commercial and Bradford streets) sells a gallon of regular gasoline for $2.31, with 6¢ Tuesdays, where the pump price is automatically discounted by 6¢ at the pump, if you gas up on a Tuesday. At the Gulf station, across the street, the current price is $2.46 for a gallon of regular, every day of the week. There is no significant difference in the quality of the gas sold by small independent stations compared to that sold by brand name refiners, since federal regulations govern octane and cleaning additives used in all gasoline sold in the US, though various major brands might include extra additives of their own. Any distinction in performance, though, would be just the tiniest difference in gas mileage, so bigger does not mean better. You may even choose to pay a higher price in order to support a small, independent gas station rather than a corporate giant. Cumberland Farms, on Shank Painter Road, currently gets $2.37 per gallon, which will be discounted at the pump by 10¢ per gallon if you pay with their SmartPay card, which automatically makes a withdrawal from your checking account, once you set it up. You can pick up a card at the store and register it online, or order the card online, linking it to your checking account while you're at it, or you can download the app and pay for gas with your cell phone, all at 10¢ a gallon off the posted price, every day. The price on the sign above, in South Dennis, has held steady for weeks, among the lowest prices in Barnstable County, as long as you pay in cash. Stations in Bourne offer the same price, but that's a long way to go for gas. You'll find this Mobil station at 452 East-West Dennis Road, which is Route 134, at the corner of Theophilis Smith Road. That sounds complicated, but you'll find it pretty easily, within a few blocks of exit 9A off the Mid-Cape Highway, which is Route 6. From the exit, turn south, toward Fresh Pond and Route 28. It'll be on your left, just past Patriot Square, right across the street from the Mid-Cape Home Center. 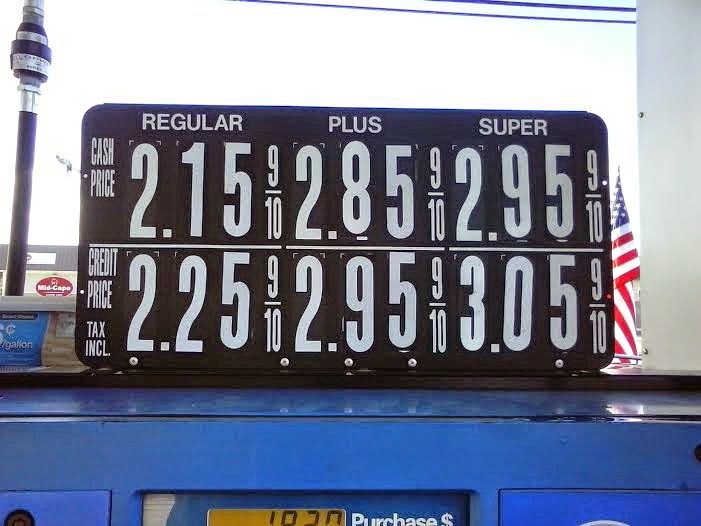 To find the cheapest gas anywhere on the Cape at any given moment, click on my link to cheap gas on Cape Cod. It'll take you right to the Barnstable County page of a website that tracks gas prices all over North America. You'll find a chart showing up-to-the-minute gas prices reported by consumers throughout the county, which includes the entire Cape, and a few spots beyond. It may not be worthwhile to go out of your way just for a tank of cheap gas, but if you're on your way up Cape to do some errands, you might as well scope out the best bargain on gas near your destination and fill up while you're in that neighborhood. At the moment, you can save as much as 31¢ per gallon over Provincetown prices. And if you're traveling, look up gasbuddy.com, where you can find current gas prices anywhere in the US or Canada by entering a city, state, province or zip code. John had a short stack, coffee, and the Sunday Paper. 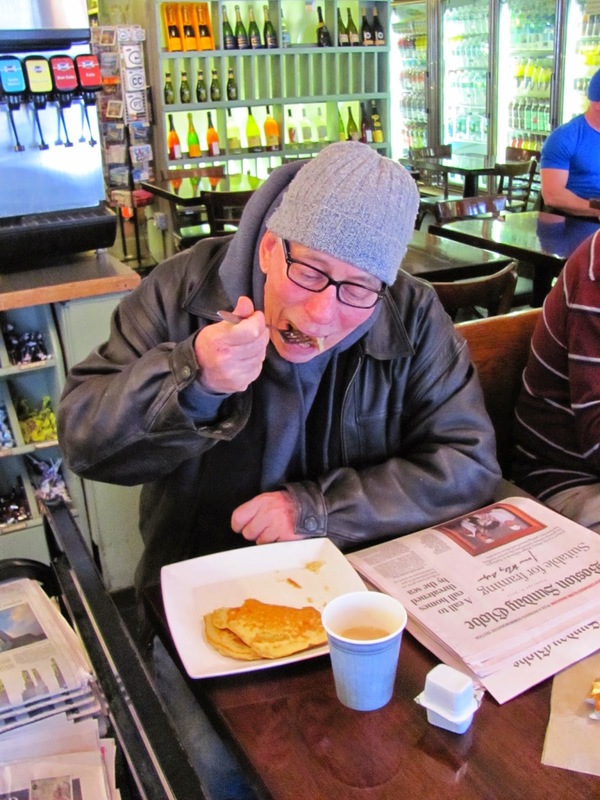 John enjoyed the pancake breakfast special offered last Sunday by Far Land Provisions, along with his Sunday paper. Despite another dire prediction of still more snow, and all of the flakes that had been quietly blanketing the town all night, the place was hopping. Rebecca, behind the counter, just couldn't help dancing a bit to the music that was playing as she rang up customers… It was a sort of R & B/Mowtown/Oldies mix. Later on there was mellow jazz, 80s pop, you name it. Must be part of Far Land's "something for everybody" policy. Raul and Oscar were in the deli, cranking out breakfast sandwiches and bagels, and that day's killer pancakes, and customers were greeting old friends and meeting new ones as a wide cross section of the town turned out for something good to eat, and a comfy place to meet. I met folks from Truro, Eastham and Australia, and dozens of Townies came in for breakfast and lunch while I was writing this, thanks to the free Wi-Fi at Far Land. When Tom Boland and Jim Farley started this little market, about 15 years ago, they wanted it to become a comfortable gathering place for Townies and visitors alike, with the feeling of an old-fashioned general store. That's why they carry toothpaste, laundry soap, batteries and assorted sundries alongside fresh produce, impeccable meats, a selection of spirits, and made-from-scratch baked goods every day. syrup, and added a bit of Turkey sausage to my breakfast. As this neighborhood market has grown and evolved over the years, they've added a variety of products and services along the way. At Far Land you can pick up a flashlight for that upcoming hurricane, get great deli sandwiches and prepared foods to take out or eat in, or have your back yard barbecue, clambake or winter solstice party catered. This winter they're serving a different dinner special every Monday through Thursday, to take out or eat in, from 4:30 to 7 PM. Tomorrow night's specials are Salisbury Steak with mushroom gravy, or a vegetarian version with herb gravy. Both are served with sides of mashed potatoes and creamed corn. Of course, you can also choose your own combination of dishes from the deli case of splendid prepared entrées, veggies, salads and side dishes, like grilled salmon, baked mac 'n cheese or a lighter choice like turkey meatloaf. The grilled veggies are among my favorites here, and I can't wait to try the maple chili roasted acorn squash, and the chicken, leek and parmesan pie. Don't forget to save room for dessert, too, with up to two dozen or more ever-changing pies, tarts, torts, cookies, brownies, puddings or cakes on any given day, always fresh and always from scratch. Today there were 26 choices, including two gluten free cakes. 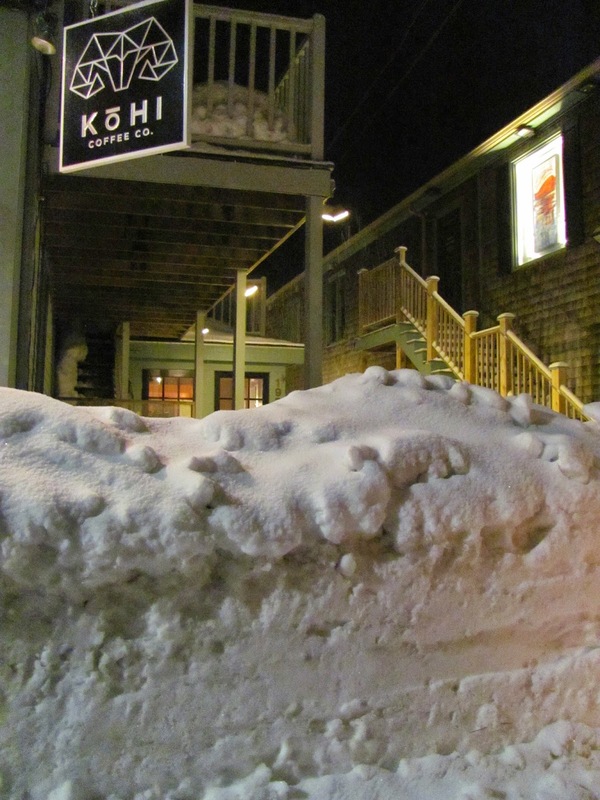 Who says there's nowhere to eat in Provincetown in the winter? If you haven't yet tried a meal at Far Land (or one to take out,) try their new Townie Winter Dinner, and watch for daily soups, lunches, and even a breakfast special here and there, throughout the winter, when there's time to make all of this.